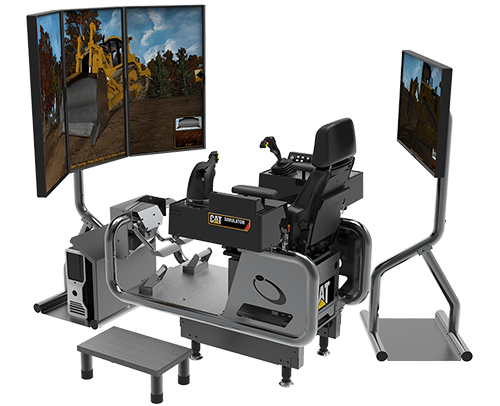 The Track Type Tractor Simulator System is designed to train heavy equipment operators on proper safety and operating procedures. New operators will learn how to conduct a machine walkaround, gain controls familiarization, plus learn specific applications innate to the actual machine. Each training exercise measures and records the operator’s simulation sessions so instructors, administrators and the student can see the results. Instructors can identify inefficiencies or weaknesses so the operator can focus on training to correct or strengthen the areas. Experienced operators can benefit from simulator training to extend and refine their skills. This type of unique training can be used as a self-study tool or to enhance an instructor-led program. Hardware – Frame and controls needed to operate the simulator, computer, mouse, keyboard, seat, two monitor stands and choice of one or three 43″ front monitors and one 32″ back monitor. Software – Track Type Tractor Simulator software and SimU Campus Training Records Management software. Languages supported in the software include English, Spanish, French, Chinese, Arabic and Danish. System comes with exclusive companion training material. An eBook is available on an iPad to extend simulator training. Topics include safety, maintenance, application methods, video examples, operation tips, how-to images and more.